2013 started off with exceptional overnight arrivals. January, February, and March of this year saw 17.2%, 14.3%, and 13.0% increases, respectively, when compared to last year’s overnight arrivals. Arrivals for July and August did not disappoint. There was an estimated increase of 8% for both months. Overall, the period of January – August 2013 saw roughly 17,228 more visitors than 2012. 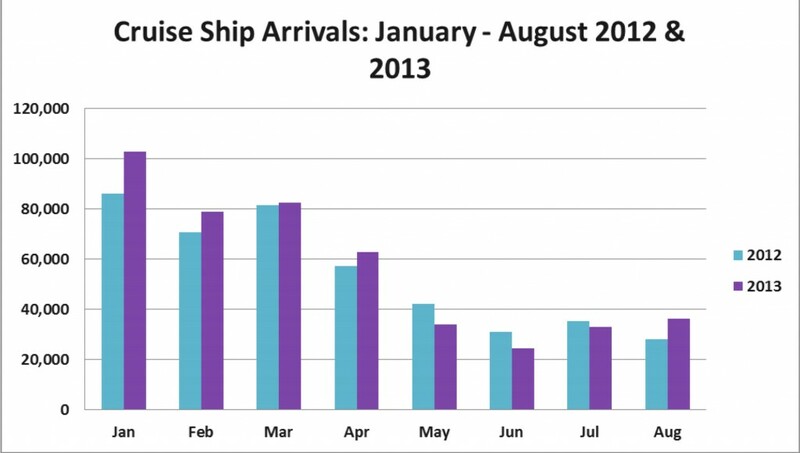 The chart below shows the arrivals of overnight visitors from January through to August of 2012 and 2013. Arrivals this year, thus far, have surpassed 2012 for every month, except April. Overall, overnight visitors have increased by 8.7%. With these numbers, we are well on our way to making the 300,000 overnight visitors mark. Cruise tourism got off to a promising start this year. January 2013 saw an increase of 19.4% compared to 2012. February, March, and April also saw encouraging increases. Cruise arrivals fell for May, June, and July, but made an outstanding recovery in August with a 30.2% increase over August 2012. Overall, cruise is performing at a 5.3% increase over last year. With border figures still pending for July and August, these figures are an estimate for the period of January to August, 2013. An update for the first three quarters of 2013 will be issued shortly. The Belize Tourism Board (BTB) is a statutory body within the Belize Ministry of Tourism and Culture, and it is governed by a Board of Directors appointed by the Minister of Tourism and Culture. The BTB works in conjunction with members of the private sector - including the Belize Hotel Association, Belize Tourism Industry Association and Belize National Tour Operators Association – and is dedicated to building tourism in the most economically and environmentally sustainable manner. As a part of its responsibilities, the BTB promotes Belize as a premier tourism destination to both in-country and international consumers. Among its outreach to the international travel market, the BTB markets the country’s unique attractions to travellers, members of the travel trade industry and media outlets in key markets.